Cove dishwasher will make its debut in April 2019. It has always been a sour point for Sub-Zero | Wolf to lose the mindshare of their customers to German manufacturers when it comes to high-performance dishwashers. After all, this is the company that prides itself defining the ultra-high-quality residential appliances market in the US since 1945. In this review, we will go over the main features and value proposition of Cove dishwashers. In the upcoming months, we intend to update this article with information we collect from the field under real-life use. Ever since the introduction of the Wolf range into the residential market in 2000, Sub-Zero has been looking into completing their kitchen appliances line-up with dishwashers. The first move was to take over the distribution of Swedish luxury appliance maker, Asko, in the US. However, Asko was slow to catch up with Bosch and Miele dishwashers in terms of performance, convenience, and styling. Then the 2008 financial crisis slowed down Sub-Zero's ambitions to introduce a new dishwasher to the market. But eventually, plans were drawn to open a new factory and conduct research at a relentless pace. After years of refinement, the new dishwasher received the name "Cove" as a winking prank on all of the appliance industry buffs and conspiracy theorists who were circulating the name "Flow," or "Wolf" spelled backward. But before the naming and soon-to-come release in April, Cove dishwashers underwent an absolutely stunning level of factory research, technical examination, supply chain assessment to ensure the highest quality parts, world-class Q/A work, customer research to determine their unique needs, training, testing, and even floor planning at dealer locations. Now, the Cove dishwasher is nearly here. So what does it have to offer? Let's take a look. What sets Cove dishwashers apart from the competition? We evaluate dishwashers in our buying guide primarily using the following four metrics: Quietness, Design, Cleaning & Drying Ability, and Reliability/Longevity. Let's look at how Cove fares in these areas. The Cove features an absolutely astounding noise level of 42dB. That's so gentle that the machine requires an illuminated light to tell you that it's even running. Over 23 pounds of insulation material are used in each Cove machine, making them one of the most quiet dishwashers available anywhere on the market. And silent operation matters, because a dishwasher is often located near the central living area of your home. A noisy dishwasher can distract from the game night or make it difficult to hear the television. As a result, appliance makers have been working hard for years to reduce the noise level of their machines. Nowadays, any machine that operates under 48dB is considered quiet. For some reference, the noise level of a library is right around 40dB while normal conversation is usually about 55 dB in volume. That's what makes the Cove's astounding 42dB quietness rating so impressive. You'll have to put your ear up to the dishwasher's front panel just to hear it. Check out our blog post "What is the Quietest Dishwasher - Your 2019 Guide" for more in-depth information about quietness. In addition to its silent operation, Cove dishwashers feature a gorgeously designed exterior. It boasts a panel-ready design that allows it to be matched to any home décor, and also can be ordered with an optional stainless steel panel and handles designed to match existing Sub Zero-Wolf steel grain and handle designs. The Cove also features a perfectly flush installation with your existing cabinets. Inside the machine, you’ll enjoy LED interior lights with a luxurious gradual dimming setting. Flexible tines and racking setups feature green elements to signal where you can customize the arrangements. This lets you easily organize your unique dishes, pots, and pans. Thanks to built-in stemware holders, the Cove can handle up to 24 wine glasses and treat them gently with a dedicated China/Crystal program. A 3rd rack offers space for silverware and cookware as well as its own dedicated full-length spray arm. Many homeowners find that installing their dishwasher perfectly level is a challenge. Not the Cove. It features front-leveling legs to make installation a breeze and ensure that you’ll always get perfect alignment between your dishwasher and your countertops. With 60cm panels and 4 inches or 6 inches toe-kick options, the Cove is also an ideal match for European-style cabinets. The cleaning and drying ability of the Cove is also impressive. The Cove also features a built-in water softener, which helps by both eliminating water spots and also increasing the longevity of your dishwasher by avoiding calcium build-up in the pump, motor, or internal pipes and tubes. This is particularly helpful for customers in the state of New Jersey, where hard water is common. The hidden heat element and fan-assisted drying power dissuade any fears of European brands’ chief complaint, which is that they don’t perform well when drying plastics. The hidden 900-watt element is sure to make that concern a thing of the past, particularly when you consider the special Plastics drying cycle. The heating element is hidden to protect lower-rack dishes from being melted from close contact with the element. The heart of any dishwasher is its filtration of water during the cleaning cycle. Cove uses a 4-stage system to constantly separate soils from the water and provide fresh cleaning power. It also boasts a Sensor Wash, which automatically adjusts water consumption and varies temperature to provide the most optimum clean for any scenario. The Cove is the only dishwasher in the world with two pumps and two distinct motors, which helps separate the water intake from discharge. This dramatically improves performance and longevity and ensures fresh water intake without re-deposits. As is customary with premium dishwashers, Cove meters the water intake to account for changes in pressure during inflow—rather than a timed water intake which can become a problem during peak water usage hours. If you have babies who use baby bottles at home, you’ll love the high-temperature Sanitize cycles designed to rid items of germs for an NSF-grade clean. The Cove brings plenty of cycle options to the table, many of which are familiar and some of which will come as a welcome surprise. Auto is perfect for all soil levels, automatically adjusting to optimal wash time, temperature, and water consumption. Normal is ideal for average cleaning needs resulting from daily use, while Heavy is excellent for heavily soiled dishes that need more time, heat, and water. Alternately, the Quick cycle is great for a fast, efficient wash for minor soiling. Other cycles include Pots & Pans, which increases wash time and temperature, Soak & Scrub, for the most heavily soiled dishes, and Light, for very lightly soiled dishware. You'll also enjoy cycles for China/Cyrstal, Rinse/Hold (which rinses off dishes for future cleaning), Plastics, Energy (designed to reduce energy consumption), and Extra Quiet for an absolutely silent cycle. In addition to these cycles, the Cove also features a long list of wash options. These include Delay Start, which can delay the wash cycle by 1-12 hours, High Temp Wash, which increases the main wash water temperature, and Sani Rinse, which increases the rinse water temperature and extends the rinse time by 15 minutes (sanitizing dishes per NSF/ANSI standards for residential dishwashers). You'll also love the Extra Dry cycle that extends drying time by 30 minutes as well as the Top Racks Only cycle which focuses washing power on just the upper racks. The Cove dishwasher is designed, tested, and proven to stand up to 20 years of regular use, and features an industry-leading 5-year warranty plus limited lifetime parts warranty. Using a factory-certified installer from Designer Appliances can even extend that warranty an extra year, for a total of 6 years. Additionally, there is a built-in leak detection system, designed to shut off water flow in the event of a leak to prevent damage to your home. 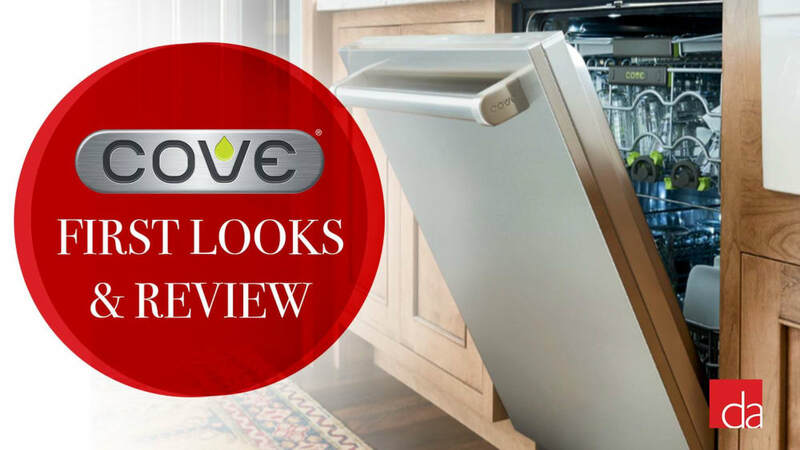 Overall, Cove dishwashers are sure to make a major splash in the high-end appliances market. It's too early to tell whether this new product will provide consistently great performance and earn positive customer feedback. Sub-Zero has been preparing for this moment for a long time, so we certainly expect to see powerful results. If the rest of your appliances are Sub-Zero/Wolf branded, then this may be the perfect way to complete your appliance set visually. But the real reason to purchase the Cove is the same reason we recommend the purchase of any Sub-Zero/Wolf brand appliance-- the peace of mind that comes from the industry's best service and ultimate build quality. Is Sub Zero the same company as Wolf ranges? Correct, Sub Zero refrigerators are part of the same company as Wolf appliances. While Sub Zero is the gold standard of built-in refrigeration Wolf ranges are a staple of the most luxurious pro kitchens. In our family, we always argue about how to load our dishwasher. Do you have any recommendations on how to load the Cove dishwasher?